Pumpernickel's requires a minimum of 24 hours notice to cancel any order over $1,000 (before taxes). For some large/special orders, we may require 48-72 hours. Improper notice may result in a full charge. Some small orders may be cancelled by 7:00 a.m. the day of delivery. The delivery charge of a particular location depends on the proximity to our restaurant, size of the order and difficulty of the delivery. Deliveries within walking distance are subject to a delivery charge that will be determined at check-out or by our hotline team member. Further distances in the GTA are subject up to $25.00 for delivery. Please be advised that all orders must meet a minimum of $85.00 before taxes to be eligible for delivery. Orders under $85.00 before taxes can be prepared for pick-up at your closest Pumpernickel's location. Orders outside our regular delivery jurisdiction may be subject to a delivery charge greater than $25.00, as well as an increased minimum order requirement. We provide a drop-off delivery service. All orders will be dropped off at the floor/suite/room within the time frame specified on the confirmation/invoice. Please arrange for quick and easy access to the drop-off location during the delivery window. Additional service or changes made to the drop-off location must be arranged with our catering coordinators in advance. Pumpernickel's requires a 30 minute delivery window for all orders. On busier days, we may require a 60 minute delivery window to accommodate all of our customers. We will do our best to advise you ahead of time if we require a longer delivery window. If this will be an issue, please let us know ahead of time and we will do our best to accommodate your request. Deliveries are outgoing from 7:30 a.m. to 5:30 p.m. on Monday to Friday, excluding holidays and weekends. Deliveries scheduled outside our regular hours may be subject to additional fees and/or service charges. Most of our menu items have minimum quantity requirements. Please note that for long distance deliveries, there may be an increase in our minimum order requirements. Please allow at least 24 hours? notice when placing an order, some items may require a minimum of 72 hours? notice. Pumpernickel's does their best to accommodate any last minute/same day orders; however there is no guarantee that we can accommodate it. Further, last minute/same day orders have no delivery or time guarantee. They may also be subject to an additional charge and are not eligible for our quantity discount pricing. Upon special request, Pumpernickel's Catering is open on Saturday?s. Please be advised that we are not open on Sunday?s (some exceptions may apply). To accommodate your order, we require a minimum order of $500 before taxes. Weekend orders may be subject to additional charges and/or service fees. Kindly submit your order to our catering coordinators by the Wednesday prior to your event. All changes must be finalized by Thursday end of business day. For any further questions or information, please contact Pumpernickel's Head Office. It is Pumpernickel's practice to provide you with a copy of the invoice upon delivery. If you do not wish to have your invoice brought to the delivery site, please advise your catering coordinator and they will email you the invoice. If you require a copy of your credit card receipt, kindly let your catering coordinator know prior to or the day of your event, as some paperwork is sent to Pumpernickel's Corporate Office. Pumpernickel's is not an allergen free facility. We will make every effort to accommodate your needs however, Pumpernickel's makes no guarantee, implied or otherwise, that cross contamination has not occurred. We accept VISA, MasterCard and American Express. We also accept cash and cheque with a credit card for security. For deliveries with cash payment, please have exact change as our drivers do not carry change with them. Corporate accounts (invoicing) are available with a submitted and approved credit application. Pumpernickel's payment terms for corporate accounts are net 30 days. 2% interest per month will be charged on any outstanding invoices. Our food arrives on disposable plastic lucre trays. Our trays are reusable and recyclable. Please help us preserve the environment and keep your trays, we will pick them up on our next delivery. We also offer ceramic trays for VIP Presentation, at an additional charge of 15% of the total food cost. For optimal presentation, use our ?First Impressions? line! Our First Impressions are made from plastic, but look like real China, available for $0.79/per person. To help save the environment, choose our biodegradable disposables for $0.55/per person. Hot food is served in disposable foil trays, practical for reheating if necessary. Our food is transported in cambros (large thermoses) so your food arrives hot and ready to eat. If you require chaffing dishes, we supply them for a fee of $29.00 per dish, as well as a pick up charge at the same rate of the delivery charge. Some locations have disposable chaffing dishes for $25.00 and fuel cans for $3.00 each. We co-ordinate rental and delivery of china, flatware, chafing dishes, linens, tables, chairs, gas ovens, BBQ equipment, etc. Minimum 72 hours? notice is required. Waiters can be arranged for any event, ranging from $25.00-$30.00 per hour (minimum 4 hours). 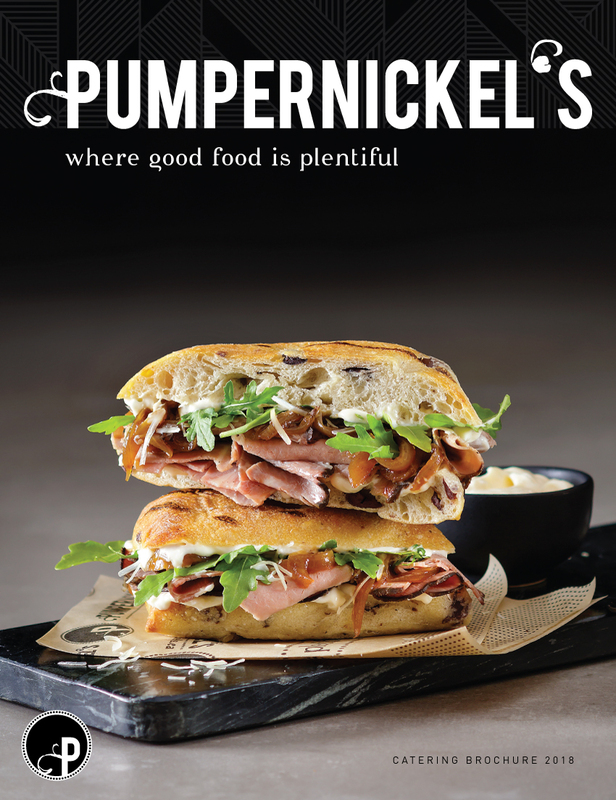 Pumpernickel's reserves the right to adjust prices at any time on our published menu items, based on market fluctuations and item availability. Price changes may not be reflected on our menus. Our staff will make every effort to communicate price changes when an order is placed. Most of our prices are in a tiered system; the larger you order the more you save. Please note that we also have minimums for each of our items. You must order a large quantity of the same item and you cannot combine different items to move into a higher tier. If we accept an order below our minimum requirements, an extra charge may be applicable. Pumpernickel's requires a copy of your organization?s Certificate of Exemption Number to be eligible for tax exempt status. Sales Tax Exempt Purchaser Certificate will be kept on file.